In-memory database startup MemSQL has come out with a distributed version of its database, enabling customers to work with much larger data sets stored in memory while ensuring that speeds stay high. It’s a nod toward the fact that users still want answers to queries right away, even while the amount of data companies store just keeps on growing. With this release, users will be able to scale MemSQL data sets across multiple commodity nodes to enable processing of big workloads at hyperscale. Previously, the MemSQL database was limited to implementations on a single box. The new version is really just the original one modified to scale out to more machines, said Eric Frenkiel, the company’s CEO and co-founder. 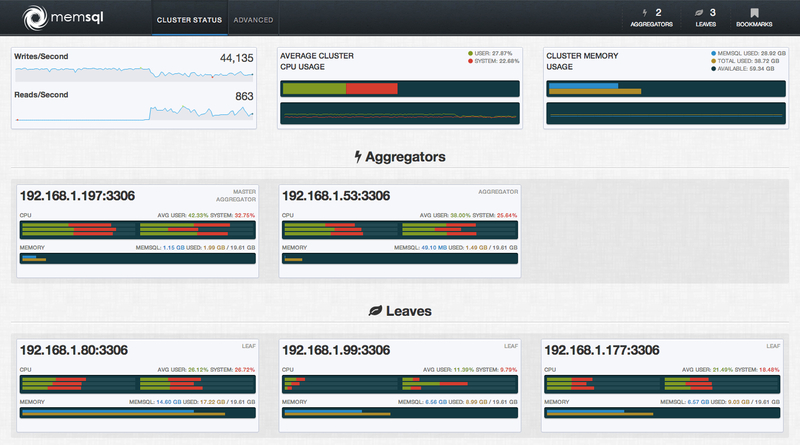 The new version also comes with the MemSQL Watch dashboard to keep track the performance of the database cluster. The sweet spot for MemSQL, which takes SQL queries and converts them to C++, is comparing fresh data with recent historical data. What does that look like? One company that has been using the MemSQL distributed database before the general release, Zynga, (s znga) looks at how games perform from week to week. Gradually, they expanded their cluster to check across larger time frames. MemSQL might not be the answer for everyone — different companies have different needs when it comes to databases — but it should at least pique the interest of a lot of companies. No one has ever asked for a slower, less-scalable database. This story was updated at 4:45 p.m. PT to clarify Zynga’s use of the MemSQL distributed database.